This article is about the political and geographic term. For other uses, see Frontier (disambiguation). "Virgin land" redirects here. For other uses, see Virgin land (disambiguation). A restored pioneer house at the National Ranching Heritage Center in Lubbock, Texas, US. A frontier is the political and geographical area near or beyond a boundary. The term came from French in the 15th century, with the meaning "borderland"—the region of a country that fronts on another country (see also marches). A frontier can also be referred to as a "front". A difference has also been established in academic scholarship between Frontier and Border, the latter denoting a fixed, rigid and clear-cut form of state boundary. In the European Union, the frontier is the region beyond the expanding borders of the European Union itself. EU has designated the countries surrounding it as part of the European Neighbourhood. This is a region of primarily less-developed countries, many of which aspire to become part of the union. Current applicants include Turkey and many small countries in the Balkans and South Caucasus. Romania and Bulgaria joined EU in 2007. Proposals to admit Turkey have been debated but are now currently stalled, partly on the ground that Turkey is beyond Europe's historic frontier and it is yet to comply with the 35 point policy areas set out by EU. If all or most East European states become members, the frontier may be the boundaries with Russia and Turkey. The expansion of Russia to the north, south (Wild Fields) and east (Siberia, the Russian Far East and Russian Alaska) exploited ever-changing frontier regions over several centuries and often involved the development and settlement of Cossack communities. The term "frontier" was frequently[quantify] used[by whom?] in colonial Australia in the meaning of country that borders the unknown or uncivilised, the boundary, border country, the borders of civilisation, or as the land that forms the furthest extent of what was frequently termed "the inside" or "settled" districts. The "outside" was another term frequently used in colonial Australia, this term seemingly[original research?] covered not only the frontier but the districts beyond. Settlers at the frontier thus frequently referred to themselves as "the outsiders" or "outside residents" and to the area in which they lived as "the outside districts". At times one might hear the "frontier" described as "the outside borders". However the term "frontier districts" was seemingly[original research?] used predominantly in the early Australian colonial newspapers whenever dealing with skirmishes between black and white in northern New South Wales and Queensland, and in newspaper reports from South Africa, whereas it was seemingly not so commonly used when dealing with affairs in Victoria, South Australia and southern New South Wales. The use of the word "frontier" was thus frequently connected to descriptions of frontier violence, as in a letter printed in the Sydney Morning Herald in December 1850 which described murder and carnage at the northern frontier and calling for the protection of the settlers saying: "...nothing but a strong body of Native Police will restore and keep order in the frontier districts, and as the squatters are taxed for the purpose of such protection". The word "frontier" has often meant a region at the edge of a settled area, especially in North American development. It was a transition zone where explorers, pioneers and settlers were arriving. Frederick Jackson Turner said that "the significance of the frontier" was that as pioneers moved into the "frontier zone," they were changed by the encounter. For example, Turner argues in 1893 that in the United States, unlimited free land in this zone was available, and thus offered the psychological sense of unlimited opportunity. This, in turn, had many consequences such as optimism, future orientation, shedding the restraints of land scarcity, and the wastage of natural resources. In the earliest days of European settlement of the Atlantic coast, the frontier was any part of the forested interior of the continent lying beyond the fringe of existing settlements along the coast and the great rivers, such as the St. Lawrence, Connecticut, Hudson, Delaware, Susquehanna River and James. English, French, Spanish and Dutch patterns of expansion and settlement were quite different. Only a few thousand French migrated to Canada. These habitants settled in villages along the St. Lawrence river, building communities that remained stable for long stretches, rather than leapfrogging west the way the English and later Americans did. Although French fur traders ranged widely through the Great Lakes and Mississippi River watersheds, as far as the Rocky Mountains, they did not usually settle down. French settlement in these areas was limited to a few very small villages on the lower Mississippi and in the Illinois Country. The Dutch set up fur trading posts in the Hudson River valley, followed by large grants of land to patroons, who brought in tenant farmers that created compact, permanent villages. They did not push westward. In contrast, the English colonies generally pursued a more systematic policy of widespread settlement of the New World, for cultivation and exploitation of the land, which required the extension of European property rights to the new continent. The typical English settlements were quite compact and small—under 3 square kilometres (1 square mile). Conflict with the Native Americans arose out of political issues, i.e. who would rule. Early frontier areas east of the Appalachian Mountains included the Connecticut River valley. 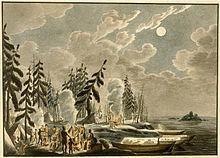 The French and Indian Wars of the 1760s resulted in a complete victory for the British, who took over the French colonial territory west of the Appalachians to the Mississippi River. Americans began moving across the Appalachians into areas such the Ohio Country and the New River Valley. Most of the frontier movement was east to west, but there were other directions as well. The frontier in New England lay to the north; in Nevada to the east; in Florida to the south. 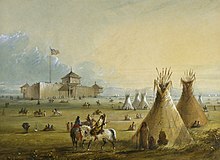 Throughout American history, the expansion of settlement was largely from the east to the west, and thus the frontier is often identified with "the west." On the Pacific Coast, settlement moved eastward. A "Canadian frontier thesis" was developed by Canadian historians Harold Adams Innis and J. M. S. Careless. They emphasized the relationship between the center and periphery. Katerberg argues that "in Canada the imagined West must be understood in relation to the mythic power of the North." [Katerberg 2003] This is reflected in Canadian literature with the phrase "garrison mentality." In Innis's 1930 work The Fur Trade in Canada, he expounded on what became known as the Laurentian thesis: that the most creative and major developments in Canadian history occurred in the metropolitan centers of central Canada and that the civilization of North America is the civilization of Europe. Innis considered place as critical in the development of the Canadian West and wrote of the importance of metropolitan areas, settlements, and indigenous people in the creation of markets. Turner and Innis continue to exert influence over the historiography of the American and Canadian Wests. The Quebec frontier showed little of the individualism or democracy that Turner ascribed to the American zone to the south. The Nova Scotia and Ontario frontiers were rather more democratic than the rest of Canada, but whether that was caused by the need to be self-reliant at the frontier itself, or the presence of large numbers of American immigrants is debated. The Canadian political thinker Charles Blattberg has argued that such events ought to be seen as part of a process in which Canadians advanced a "border" as distinct from a "frontier" – from east to west. According to Blattberg, a border assumes a significantly sharper contrast between the civilized and the uncivilized since, unlike a frontier process, the civilizing force is not supposed to be shaped by that which it is civilizing. Blattberg criticizes both the frontier and border "civilizing" processes. The pattern of settlement of the Canadian prairies began in 1896, when the American prairie states had already achieved statehood. Like their American counterparts, the Prairie provinces supported populist and democratic movements in the early 20th century. Following the victory of the United States in the American Revolutionary War and the signing Treaty of Paris in 1783, the United States gained formal, if not actual, control of the British lands west of the Appalachians. Many thousands of settlers, typified by Daniel Boone, had already reached Kentucky, Tennessee, and adjacent areas. Some areas, such as the Virginia Military District and the Connecticut Western Reserve (both in Ohio), were used by the states as rewards to veterans of the war. How to formally include these new frontier areas into the nation was an important issue in the Continental Congress of the 1780s and was partly resolved by the Northwest Ordinance (1787). The Southwest Territory saw a similar pattern of settlement pressure. For the next century, the expansion of the nation into these areas, as well as the subsequently acquired Louisiana Purchase, Oregon Country, and Mexican Cession, attracted hundreds of thousands of settlers. Whether the Kansas frontier would become "slave" or "free" kindled the American Civil War. In general before 1860, Northern Democrats promoted easy land ownership and Whigs and Southern Democrats resisted. The Southerners resisted Homestead Acts because it supported the growth of a free farmer population that might oppose slavery. When the Republican Party came to power in 1860 it promoted a free land policy — notably the Homestead Act of 1862, coupled with railroad land grants that opened cheap (but not free) lands for settlers. In 1890, the frontier line had broken up (Census maps defined the frontier line as a line beyond which the population density was under 2 inhabitants per square mile or 0.8 inhabitants per square kilometre). The effect of the frontier upon popular culture was enormous, in dime novels, Wild West shows, and, after 1910, Western movies set on the frontier. 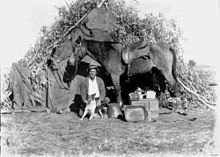 The American frontier was generally the westernmost edge of a settlement and typically more free-spirited than in the East because of its lack of social and political institutions. The idea that the frontier provided the core defining quality of the United States was elaborated by the historian Frederick Jackson Turner, who built his Frontier Thesis in 1893 around this notion. Subsequently, the frontier has also been described as the point of contact between two cultures, where contact led to exchanges that affected both cultures. ^ Mura, Andrea (2016). "National Finitude and the Paranoid Style of the One". Contemporary Political Theory. 15: 58–79. doi:10.1057/cpt.2015.23. ^ Richards, John F. (2003). "7: Frontier Settlement in Russia". The Unending Frontier: An Environmental History of the Early Modern World. California world history library. 1 (reprint ed.). Berkeley: University of California Press. p. 263. ISBN 9780520230750. Retrieved 2016-08-15. Discharged and unemployed or deserting servicemen, younger sons and other dependents of men already in frontier service in older areas, fleeing criminals, sedentarized steppe Tatars, and cossacks took up residence in or near the new centers. Decade after decade, however, peasants fleeing to the frontier made up the largest category of migrants. [...] The more venturesome Russian migrants avoided the frontier towns and peasant villages in favor of life as cossacks (from the Turkic kazak, meaning 'free man'). ^ see e.g. Sydney Morning Herald June 6, 1851 p.2g; South Australian Register, Moreton Bay Courier Feb 16, 1861, p2 and 2 April 1861, p.3 re 'The Native Police'; see Queensland Parliamentary Debate (Attorney-General Pring) (Brisbane Courier, July 27, 1861, p5); Queensland Parliamentary Debate 20 August 1863; Brisbane Courier, Aug 22, 1863 (Editorial). ^ Sydney Morning Herald Dec 24, 1850, p.3s. ^ Laycock, David. Populism and Democratic Thought in the Canadian Prairies, 1910 to 1945. 1990; Seymour Martin Lipset, Agrarian Socialism (1950). ^ Anzaldua, Gloria (1987). Borderlands/La Frontera: The New Mestiza. San Francisco: Aunt Lute Books. Clarke, John. Land, Power, and Economics on the Frontier of Upper Canada. McGill-Queen's U. Press, 2001. 747 pp. Colpitts, George. Game in the Garden: A Human History of Wildlife in Western Canada to 1940 U. of British Columbia Press, 2002. 216 pp. Forkey, Neil S. Shaping the Upper Canadian Frontier: Environment, Society and Culture in the Trent Valley. U. of Calgary Press 2003. 164 pp. Mulvihill, Peter R.; Baker, Douglas C.; and Morrison, William R. "A Conceptual Framework for Environmental History in Canada's North." Environmental History 2001 6(4): 611–626. ISSN 1084-5453. This proposes a five-part conceptual framework for the study of environmental history in the Canadian North. The first element of the framework analyzes approaches to environmental history that are applicable to the Canadian North. The second element reviews historical forces, myths, and defining characteristics that pertain to the region. A third element of the framework tests the validity of Turner's Frontier Thesis and Creighton's Metropolitan Thesis when applied to northern Canada. The fourth element consists of an overview of major northern environmental trends. The final element consists of four interrelated themes that identify the environmental relationships between northern and southern Canada. The World in 2015: National borders undermined? 11-min video interview with Bernard Guetta, a columnist for Libération newspaper and France Inter radio. "For [Guetta], one of the main lessons from international relations in 2014 is that national borders are becoming increasingly irrelevant. These borders, drawn by the colonial powers, were and still are entirely artificial. Now, people want borders along national, religious or ethnic lines. Bernard Guetta calls this a "comeback of real history"." Mura, Andrea (2016). "National Finitude and the Paranoid Style of the One". Contemporary Political Theory. 15: 58–79. doi:10.1057/cpt.2015.23.